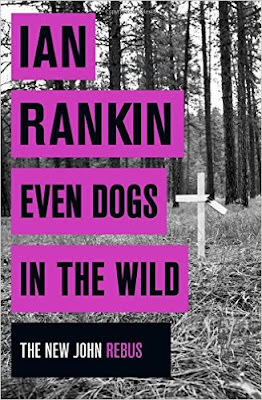 My review of Ian Rankin's Scottish crime novel Even Dogs in the Wild appeared in the Washington Times. Ian Rankin’s character Scottish Detective Inspector John Rebus was a 40-year-old detective sergeant when we first meet him in 1987’s “Knots and Crosses.” As Mr. Rankin has aged his character in real time through his 20 crime novels, the crime novelist was compelled to retire Rebus from the police force and from the center of his novels, despite his popularity with readers. Rebus is a flawed man. Brooding and sarcastic, Rebus only finds solace only in music, smoking, drinking and his job as a detective. He is estranged from his wife and daughter and has few friends. A former British soldier who served in Northern Ireland during the violent era known as “The Troubles,” Rebus joined the Scottish police and was successful as a detective. But in addition to battling organized crime members, serial killers and corrupt politicians, Rebus also took on his own police bosses. After Mr. Rankin retired Rebus in 2007’s “Exit Music,” he continued to write additional crime novels that featured Rebus‘ partner and protege, Detective Inspector Siobhan (pronounced “shi-vawn”) Clarke, as well a new character, Malcom Fox of the Complaints Bureau (which is the equivalent to Internal Affairs in most U.S. police departments). Due to his unpopular job in Complaints as well as by his nature, Fox is a righteous, sad and lonely police officer. Now in Mr. Rankin’s “Even Dogs in the Wild,” the curmudgeonly, cynical Rebus is back in the forefront. Rebus is serving as a consulting detective (like another popular fictional detective, Sherlock Holmes) for the police in Edinburgh, Scotland. Rebus is aiding Clarke and Fox in the investigation of a high profile murder of Lord David Menzies Minton, a former senior government prosecutor. The murder looks at first as if it was a random act committed during a burglary, but Clarke wonders why nothing has been stolen and she is curious about a threatening note found on the scene. Despite her youth, English background, a university degree and an interest in technology — things that are repugnant and alien to Rebus — she became his trusted friend and colleague in the earlier novels and Rebus helped her become a fine detective. Great review! I think Rebus I one of the great modern characters, and I especially like the name itself -- such a puzzle!